Over the last few years, successive governments are cracking down on shell companies to curb tax evasion. 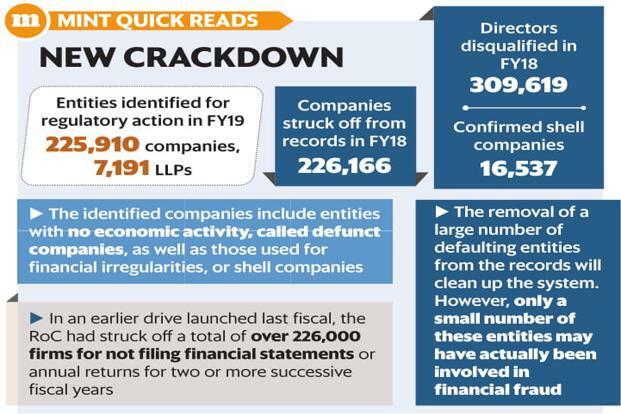 New Delhi: Over 225,000 companies and 7,000 limited liability partnerships (LLPs) face the threat of being struck off official records, with the government launching a fresh drive against companies defaulting on filing statutory returns. The identified companies include entities with no economic activity, called defunct companies, as well as those used for financial irregularities, or shell companies. 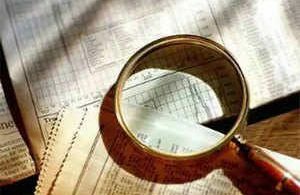 A total of 225,910 companies and 7,191 LLPs have been identified for regulatory action due to non-filing of financial statements for the two years starting FY16, the corporate affairs ministry said in a statement. The fresh crackdown will be launched this financial year. The identified entities will be given an opportunity to be heard and action will be taken after considering their response, said the statement. In an earlier drive launched in the last financial year, the Registrar of Companies (RoCs) had struck off a total of 226,000 companies for having failed to file their financial statements or annual returns for a period of two or more successive financial years. More than 300,000 directors were also disqualified for non-filing of annual returns by the companies for three years. Disqualified directors will not be in a position to sit on the boards of other companies. About 14,000 companies got relief under the ‘condonation of delay scheme, 2018’ which was in force for four months from 1 January for regularization of returns. The removal of the large number of defaulting entities from the records will clean up the system. However, only a small part of the entities struck off from records may have actually been involved in financial fraud. A task force set up in 2017 to identify shell companies listed 16,537 entities as “confirmed shell companies”. It also listed 16,739 other entities having common directorships with the confirmed shell companies. The task force has also zeroed in on more than 80,000 suspected shell companies. 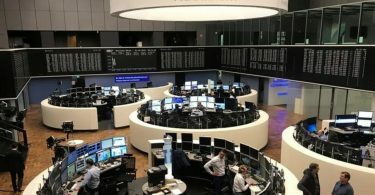 The agencies use certain parameters to identify shell firms, including identifying persons of no means sitting on the board of directors and finding discrepancies between the volume of transactions done by a company and the profits reported. Regulatory agencies will pursue cases against officers who are in default of statutory obligations even if the company is no longer in existence. The crackdown highlights the importance of closing down a company as per law as many defaulting firms may actually be cases of entrepreneurs abandoning their venture and not bothering to close down the company as per law, which makes them defaulters for not filing returns in subsequent years. Also, many entrepreneurs open new companies just to hold their intellectual property rights such as trade marks but miss filing the annual returns as such companies have no operations. “The government expects that its efforts to clean up the registry will create a transparent and compliant corporate ecosystem in India, promote the cause of ‘ease of doing business’ and enhance the trust of the public,” the official statement explained. Pavan Kumar Vijay, founder of consulting firm Corporate Professionals, said that entities that are in default should be granted the opportunity to rectify the omissions through a simple procedure. This would ensure that struck off entities will not approach company law tribunals which are already overburdened, Vijay added. The exercise of combing through records to find defaulters as well as those resorting to suspicious transactions has been a key part of the authorities’ strategy to identify instances of black money generation and money laundering. According to industry observers, businesses often under-report their income or inflate expenses through bogus transactions involving companies that exist only on paper. Over the last few years, successive governments have taken steps to curb tax evasion as well as funds that are moved out of the country coming back in the form of foreign direct investment. One key step in this regard is the renegotiation of India’s tax treaty with Mauritius.